Similar to the 2015 edition, 2016 Panini USA Soccer delivers a factory set with one autograph and one memorabilia card per box. Collectors can also find one full insert set and nine parallels. 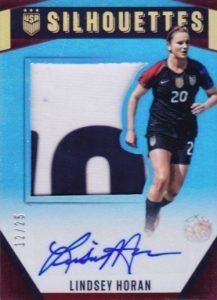 Featuring the program's updated logo and player images sporting the new team kits, the base set in 2016 Panini USA Soccer totals 48 cards spread equally across the men's and women's teams with one spot reserved for the head coaches, Jurgen Klinsmann and Jill Ellis. There are also 16 First Caps inserts that highlight the national debuts for each team, including Allie Long, Christian Pulisic, Emily Sonnett and Jordan Morris. In addition, Holographic parallels fall nine per set. 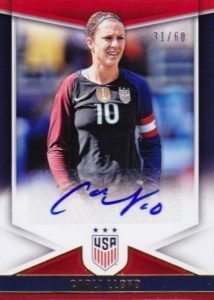 Offering the main source of variety at two per box, 2016 Panini USA Soccer hits include base Autographs, match-worn Memorabilia cards and the popular Silhouettes inserts that display a match-worn swatch and a signature. Notable signers expected for the product include Alex Morgan, Clint Dempsey, Hope Solo and Tim Howard. Specific print runs and parallel info will be added when available. Matt � For some reason, they only provided the basic list of players for the base and inserts versus the full parallels and print runs. They clearly had planned to do more with this set, notice the Alex Morgan card they used for promotion isnt even in the set, but once the USwnt lost early on in the olympics they just put out a barebones product.